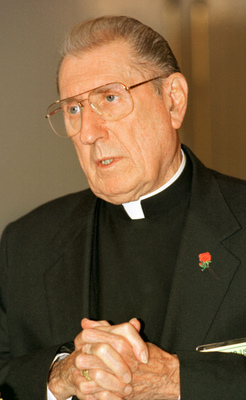 In the mid-1980s, Cardinal John O’Connor visited the Dachau concentration camp. Overwhelmed by the horrors that occurred there, he vowed to do all he could to protect and promote the sacredness of human life. This led him to be a champion of life, in word and action; including the establishment of the Sisters of Life. On Monday, May 3rd, the Archdiocese of New York will remember Cardinal O'Connor on the 10th anniversary of his entrance into eternal life. Tune in at 4pm ET for A Legacy of Courageous Love: a conference and memorial Mass in honour of Cardinal O’Connor. It will be broadcast live from New York City's St. Patrick's Cathedral. The program will begin with a series of talks. Presenters include Archbishop Timothy Dolan of New York, Mother Agnes Mary Donovan, the Superior General of the Sisters of Life, and Mrs. Mary Ward, the Sister of Cardinal O’Connor. After the talks, Archbishop Dolan will celebrate Mass in honour of Cardinal O’Connor. Celebrate and pray for life, and join us May 3rd at 4pm ET for live coverage of the conference and memorial Mass for New York's Cardinal J. O'Connor.